One big question, now that special counsel Robert Mueller has filed his report, is what the process of revealing Mueller’s findings will mean politically, which is a separate question from what additional legal issues might emerge. It may take a true bombshell — like, perhaps, a conclusion that the president did obstruct justice, or a full and explicit exoneration of the president from Mueller — to change Democrats’ and Republicans’ minds about how favorably they view Mueller and how trustworthy they find him. 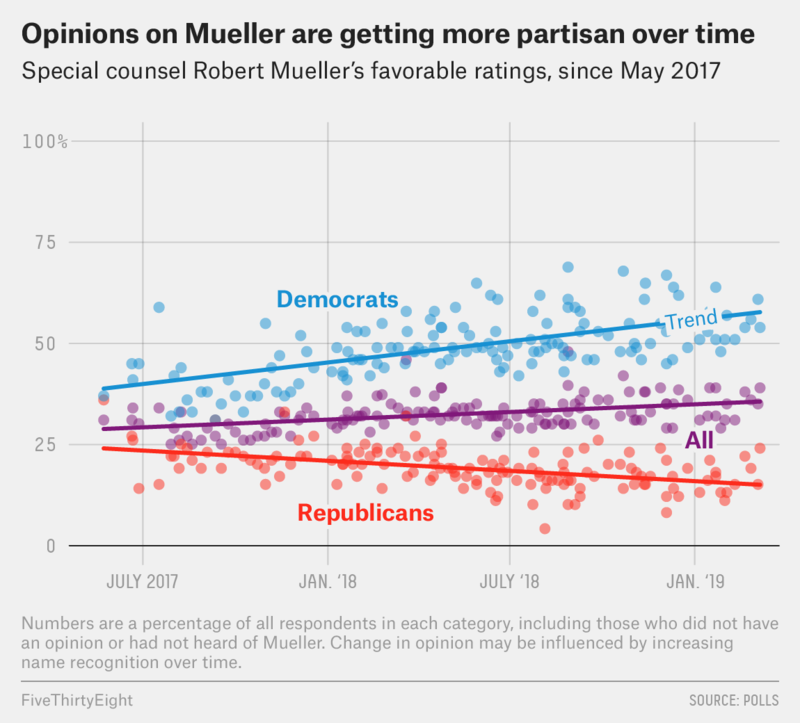 That’s because views of the special counsel have become increasingly polarized since Mueller was appointed in May 2017. Republicans in particular have grown more suspicious of Mueller — perhaps thanks to Trump’s frequent denunciations of the special counsel investigation as a politically motivated “witch hunt.” Today, Republicans are much more inclined to believe that Mueller’s investigation is unfair than they were when he was appointed. This is not to say that these numbers can’t change, especially if some important new information emerges in the coming weeks or months. In late 2018, after Mueller’s team indicted a number of people and Trump’s former lawyer Michael Cohen pleaded guilty to lying to Congress as part of Mueller’s investigation, the percentage of Republicans who believed the probe was fair increased a bit. And if the results of Mueller’s probe are sufficiently damning, impeachment isn’t off the table. According to a poll conducted last month, 61 percent of Americans support impeachment if Mueller concludes that Trump authorized collusion with Russia, and 65 percent support impeachment if Mueller concludes that Trump obstructed justice. But in terms of large-scale political ramifications like impeachment, it will likely take something big and dramatic to truly move the needle. As it stands now, Mueller’s investigation hasn’t been a political game-changer — either by providing fodder to House Democrats to begin considering impeachment proceedings against the president, or by officially clearing Trump’s name. 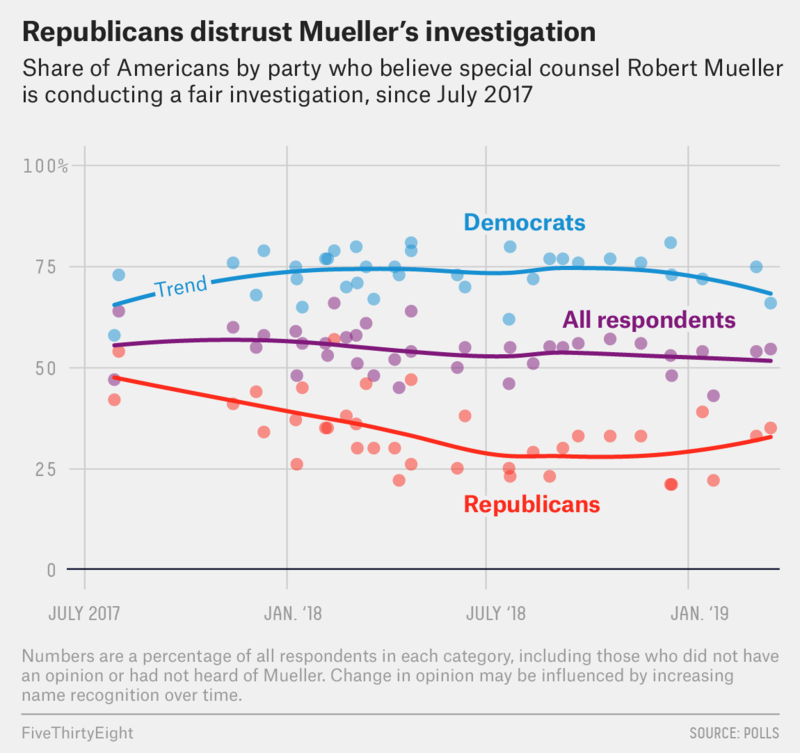 This is important because Mueller, although he didn’t have unified support from Republicans and Democrats, has still maintained some credibility as an independent investigator — he’s still largely trusted, for example, by independents. So while the political showdown over the Mueller report is already beginning, the extent of the fallout is much more uncertain. For more on the legal implications of the report, see Mueller Just Filed His Report. What Happens Next?